Helping People Feel Better… That’s Our Goal! As healthcare providers and physiotherapists, we work hard to help our patients feel their very best. Through hands-on treatment and compassionate care – using today’s most advanced techniques and equipment – we’ve helped thousands of Calgarians address their pain and recover from their injuries! Any injury sustained at work should be covered under the Worker’s Compensation Board. 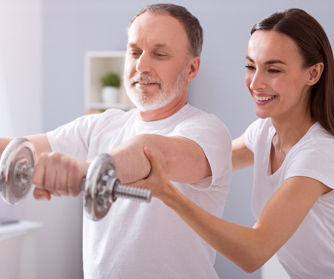 The initial physical therapy assessment is automatically covered, and if the claim is approved you will be covered for up to 6 weeks of physiotherapy. We direct bill most private benefits providers. Yours not listed here? Get in touch to confirm benefits coverage with your provider. The team at Rehab Solutions Physiotherapy is focused on helping our patients achieve their wellness goals. To accomplish this, our team utilizes several complementary modalities and techniques, including acupuncture. Before joining us for treatment, take a few minutes to learn more about our therapists. Jane Zhao (B.Sc., MBA, R.Ac. ), is a registered Acupuncturist and member of the College and Association of Acupuncturists of Alberta (CAAA). Jane graduated from the Alberta College of Acupuncture and Traditional Chinese Medicine, with an internship at Taiwan International Healthcare Training Center, where she studied and worked under the most prestigious TCM doctors and Acupuncturists in Taiwan. Jane specializes in treating acute and chronic pain relief, sports injury, digestive disorders, allergies, cold/flu, stress relief, emotional disorders, anti-aging and weight loss. Her approach is to prevent and alleviate pain and discomfort while uncovering the roots of the problem for long lasting effects. Her techniques include adjunct therapies such as Moxibustion, Cupping, Tuina (Chinese massage), Acupressure, Gua Sha, TCM nutrition, as well as Chinese herbal medicine. Peter Jarmoszuk born and raised in Poland, began his RMT career after graduation in 2006 at Vocational Medical School (Poland). Peter strives to continue his education and in 2007 took Hot Stones Therapy, Indian Head Massage and Reflexology courses at the Brighton and Hove College (England). A passion for learning led him to pursue post-graduate training and in 2012 after five years intensive program he received Masters degree in Physiotherapy at the Medical University of Lublin (Poland). His journey in Canada started in 2012 when he arrived with positive energy and a big smile on his face. At the moment Peter practices at Rehab Solutions Physiotherapy Clinic in Calgary as a Register Massage Therapist. Peter has a high-level of experience working with clients suffering from various athletic injuries, workplace and postural conditions, as well as everyday wear-and-tear issues. Because of his Physiotherapy training, as well as the many completed years of Massage Therapy Practice, he works with confidence, know-how and pride uses massage and rehabilitation techniques including deep tissue massage, myofascial trigger point therapy and soft tissue mobilisation techniques. He loves being a therapist and finds the rewards associated with this career unbelievable. He is a very sociable and cheerful person as well as being responsible and reliable. Nancy Chen, RMT is a recent graduate of The Professional Institute of Massage Therapy in Calgary. Nancy’s treatments include deep tissue massage, relaxation and reflexology. Born in El Salvador I went to study a few year law (U.M.A) university Modular Abierta, moved to Canada in 2002 with my little son. I started a new page of my life I started learning the language and the culture. worked in a few fast food jobs and also later I started studying early child care Education, a Montessori training, a legal assistant diploma, Reflexology Course, and in the last one finishing 3000 hour program of massage Therapy at Makami College. In free time like to practice Yoga, love to travel back home and L.A to spend time with family and friends I love help people to make them to feel better, since I was little I saw my uncle helping people to to fix any part of the body with musculotendon problem and one of my desires is to follow him to help others to make them feel better, I am friendly person and ready to help you, please feel free to get in touch, looking forward to meet you. University of Lethbridge – Bachelor of Science degree in biology in 1997. University of Alberta – Bachelor of Science degree in physical therapy in 2002. Numerous post graduate courses in manual therapy, McKenzie technique, neural mobilization, and acupuncture. In his free time, Damian enjoys spending time with his family going camping, hiking, biking, snowboarding. He also enjoys flyfishing, travelling and spending time with his dog Bean. Michael is a registered Physiotherapist in Alberta, Canada and the Philippines. He has been working at Rockyview General Hospital in Calgary since 2010 as a designated Physiotherapist in the following units: Cardiac, Urology, Pulmonary, Transition, ICU, Medical Assessment Unit, Emergency, and Psychiatry. He is authorized to use Functional Dry Needling, do Temporo-mandibular Joint Movement analysis, and is a Neuromuscular Retraining Practitioner. He is certified in Kinesio Taping.